I slept late again, but luckily, this time I woke up late. I got up at 10am, and hurried to get ready to go out. I left the hostel past 11:30, and was at MBK yet again for brunch at 12 noon. Yes, I know, MBK again. 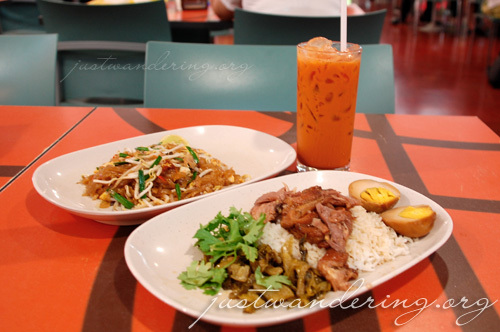 But the food center is really nice, and you can eat in airconditioned comfort, and use pretty good utensils. So far, my food expenditures in MBK never go over 150 baht every time. Today’s brunch was no exception: a serving of pad thai, pork limb over rice, Thai iced tea and a bottle of water for only 115 baht. Eating noodles and rice at the same time is hardly ever a good idea, since it can be very filling. I walked around the mall for a bit to somehow ease my very full tummy. 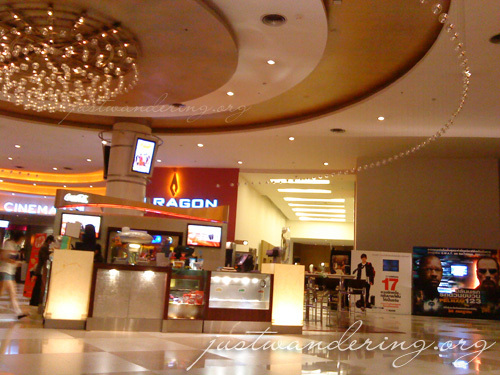 After some aimless wandering, I decided to head out back to the BTS to go to Siam Paragon to watch a movie. As I was walking on the bridge that connects the mall to the station, I ran into Dino of Columbia Sportswear. He was vacationing in Thailand with his wife and they highly recommend going to Ayutthaya. Hrm. Too bad I scrapped that idea since I’ve decided to go with a tour, but it turns out the travel agent don’t offer the day tour at this time. Now I’m too lazy to go on my own. The great thing about Siam Paragon is that it’s located right next to the BTS station. Like MBK, they have their own bridge that connect the station to the mall. I head to the fifth level, where the cineplex is and headed straight to the ticket booth. I got there just past 1:30pm, just as the movie was starting. It was too late to go in, and the next screening was for VIP. So I was stuck with nothing to do until the 3:30 show. I go down to the third floor to Kinukuniya. Afterwards, I headed into the department store, and quickly regretted it. It was full of cute things that you just want to buy everything. I was able to successfully restrain myself, until I got to the toy section, where I saw some Takara Jenny dolls and clothes for sale. There wasn’t many, but the fact that there’s Takara Jenny right there in the department store was very impressive. They also have other Japanese toy brands like Tomy (they have different variations of the Kurohige kikiipatsu game, except the limited Hard Gay version). I pick up one Jenny costume set and went off to look for more things. Just a few steps away from the toys, I came upon another great find: a voodoo doll. I’ve been itching to buy one of these, mostly because when I saw one being sold in Manila, I didn’t buy it, but when I was ready to buy, it was gone. It was a cute ex-lover version, and it’d make a great gift for a friend who’s very bitter about love. I make my way down to the supermarket to look for some snacks. There were plenty to choose from, and the range of products available is really impressive. I ended up with just one box of Pocky though, and made my way back up to the 5th level. On my way up, I came upon some car showrooms. Sports cars from BMW, Jaguar, Porche and even Lamborghini are on display right there on the 2nd floor. Wow. Back on the 5th floor, I sat in one of the many comfy seats outside the cineplex to wait for 3:30pm. 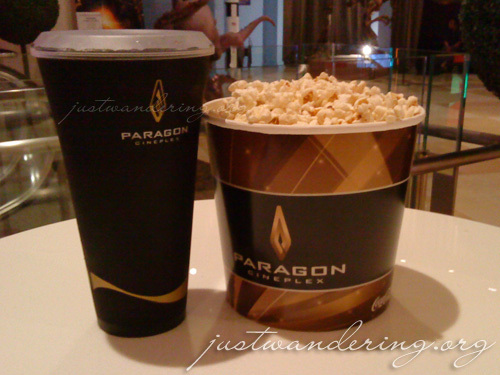 At the strike of 3pm, I buy a bucket of popcorn and a huge tumbler of soda and made my way to the theatre. However, when I got there, the attendant told me that we can’t come in for another 30 minutes. As it turns out, the time on the schedule isn’t the time of the start of the movie, but the time when the doors open. The movie didn’t really start until almost 4pm. There were a couple of movie previews, and just before the movie starts, a music video-ish thing featuring life in the Thai countryside starts, with a painter painting a portrait of the king showing every so often. After that, there was a someting written in Thai, and people around me stood up. I stood up as well, and it seems like it was a music video of a hymn of some sort for the King of Thailand. Up, Disney and Pixar’s latest collaboration, was a lovely movie. 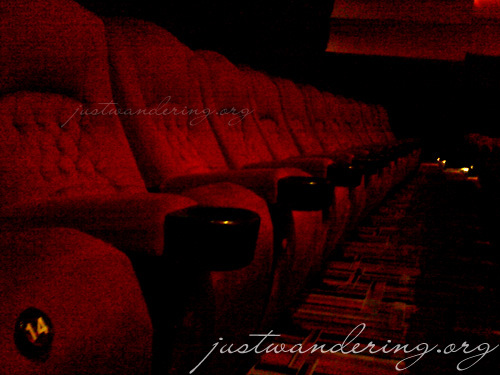 It’s made even better with the plush chairs inside the Siam Pavalai or the Grand Royal Theatre of the Paragon Cineplex. The chairs were a deep red, and reclines a bit when you lean back. The theatre was huge and beautifully decorated. It was cold inside, but it’s not the arctic-like temperature we have inside the theatres in Manila. This was another 160 baht well spent. After the movie, I head back to the BTS to go back to the hostel. 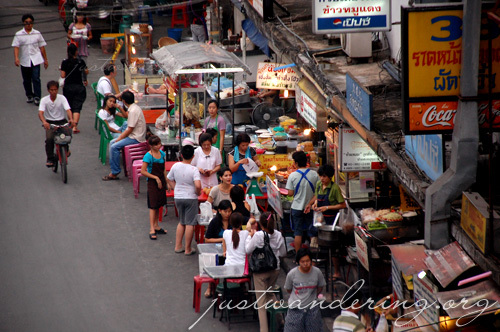 I wanted to catch the nightly food market while there’s still light out and before it starts to rain again. The stalls are already set up when I arrived around 6pm. After leaving my things in my room, I head back down for an early dinner. I passed a stall advertising Japanese pizza (okonomiyaki), and though I miss eating okonomiyaki, I went for the stall selling crispy fried pork instead. There was a printed menu posted on the stall’s window with a picture of the dish, the price, and the name in both Thai and English. I point to the dish I wanted, and settled down on a table right on the road. The shop owner delivered my food, and asked if I was Filipino. I said yes and asked how he knew. “Filipino and Thai, same same,” he said. “But Filipino no speak Thai.” I guess there must have been plenty of other Filipinos who has eaten here, specially since the Philippine Embassy is nearby. The pork was fried perfectly: the skin is crispy, yet the meat is tender enough. 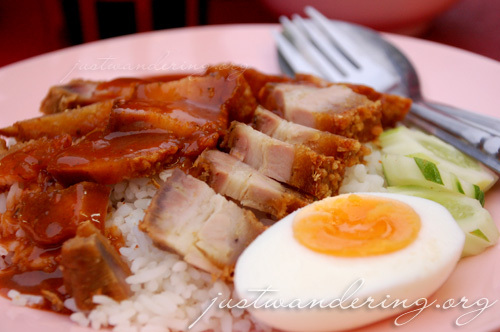 It comes slathered with sauce that went pretty good with the pork and the rice, though you can also try the other condiments available. 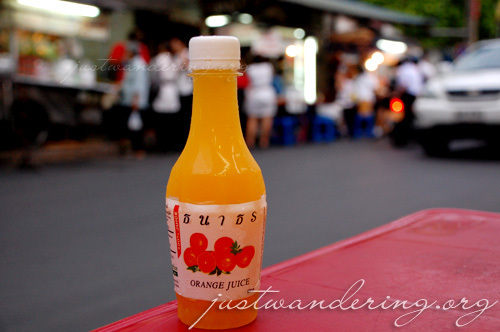 I had my simple dinner with a bottle of fresh Thai orange juice that I bought from a stall at the BTS station, and my left over bottle of water from my brunch at MBK. What more can I say? It was another great dinner for only 50 baht. I love this place. JENNEEEEH! *grabby grabby* Are you still there? Hahaha, obvious na may masamang balak no? Nina, ang haba nag bakasyon mo. i just love siam paragon, i’ll be there this weekend! more yummy food! i love it! Freeze: Naku! Bring lots of money! Nakakaaddict mag shopping dito! now i regret not buying the same same, but different shirt. haha! i’ll buy that in vietnam na lang.